Visually stunning and easy to install, Fusion outdoor balustrade injects contemporary designer style into any outdoor living area. The system can be fitted to most hard landscaping surfaces, from textured decking boards to contemporary paving slabs, or concrete layouts. You can complete the overall look with a choice of either acrylic panels or two distinctive infill option; slatted panels or vertical balusters, available in both; hardwood & softwood. 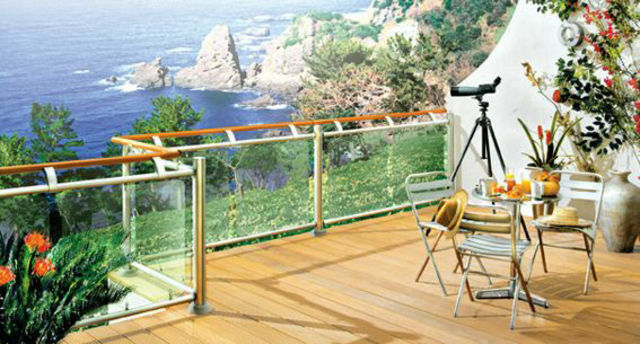 The Fusion Decking Range includes; Aluminium Rail and Hardwood & Softwood Top Rails, Aluminium Newel Posts and Hardwood & Softwood Balusters, Acrylic Infill Panels, Hardwood Slatted Infill Panels, Softwood Slatted Infill Panels, Aluminium Rail-to-Rail Brackets, Aluminium Rail-to-Newel Brackets and Baluster & Timber Rail Brackets. Treated Timber Decking Boards are also available at JAS Timber. The Richard Burbidge Fusion Aluminium Rail is only £30.60 (+ vat) & the Fusion Acrylic Infill Panel is only £48.08 (+ vat).